So, you got a holiday fruitcake for a gift... now what? OMG, what can be done with this gift? 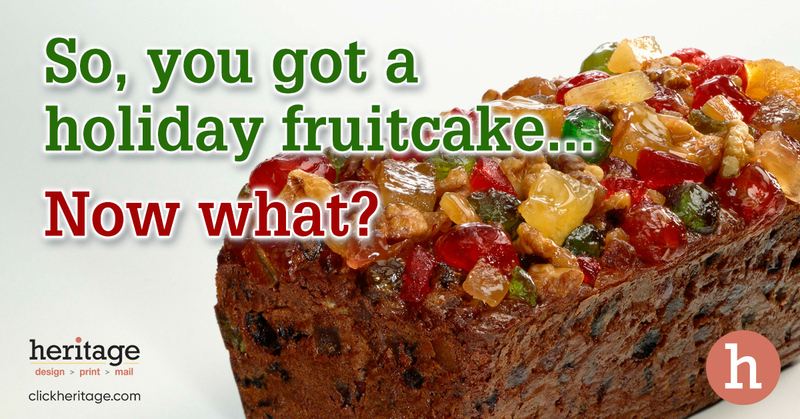 It’s that time of year and you might just get the dreaded, well-intentioned fruitcake as a holiday gift. Fruitcake… that thing that looks like a brick and is almost as heavy. That concoction that includes candied pineapple and cherries, raisins, nuts, cake and who knows what else. Fact is… 38 percent of Americans say they like fruitcake, while 52 percent say they avoid it at all costs. If fruitcake is not a favorite for your palate, here are some things you can do with one if it shows up on your doorstep. Door Stop: Fruitcakes make great door stops and have enough preservatives in them that you could probably get at least two years use before they start to look questionable. Tree Stand: Just stick a small tree in it and watch it stand up… straight! Hideaway for Valuables: Hollow out the fruitcake and store your precious items inside. Burglars are not likely to look inside this monstrosity. Wheel Chock: Parking your car on an incline? Put a fruitcake under one wheel to help prevent your car from going anywhere…just remember to remove it when you’re ready to leave. Vengeance Gift: You’re obviously a good person, but there are people in your life that you seriously can’t stand. They NEED that fruitcake, so they’ll know just how you feel about them. For those fruitcake lovers out there… enjoy the cake by yourself. Some things are best not shared. *Ideas seen in the Huffington Post a few years back, compliments of Column Five.